Now that most of the leaves have fallen and you have mulched your last little bunch, it’s time to prepare your Spartan Mower for the winter months ahead. Simply pulling it into your garage until spring rolls around won’t cut it. Check out our guide to storing your Spartan Mower for the winter. If you use your lawn mower on a regular basis, then there is a chance that it is quite dusty and covered with grass. To avoid damaging the control panel and other electrical parts, it’s important that you don’t use a power washer or water hose. If you have access to compressed air, you can use it and follow up with a wash cloth with mild detergent. You also want to make sure to remove all caked on grass clippings that have accumulated on the underside of the deck. Rotting grass can become acidic and eat away at the paint and metal, so it is important to clean both the top and the bottom of your deck. The last thing you want to do is jump on your mower in the spring to discover a dead battery. When it comes to taking care of your battery and keeping it charged, you can do a few things. Spartan recommends that you take the battery completely off, clean it, and charge it if necessary. Since it is very important to keep your battery fully charged during winter months, you may want to hook it up to a trickle charger. A trickle charger is designed to charge a battery for a long period of time by slowly adding a charge. Look for trickle chargers with automatic shut-offs so that you don’t end up overcharging your battery. Depending on who taught you everything you know about small engines and lawn mowers, you may have a different take on how to properly maintain your fuel during winter months. Spartan recommends draining the fuel tank and running your lawn mower until it stops running completely. There are a few little things that can be done to keep your zero-turn mower running like new in the spring. Make sure your tires are aired up to the correct pressure. You also want to drain the oil and replace it with fresh, clean oil. You can also replace the air filter and check spark plugs. 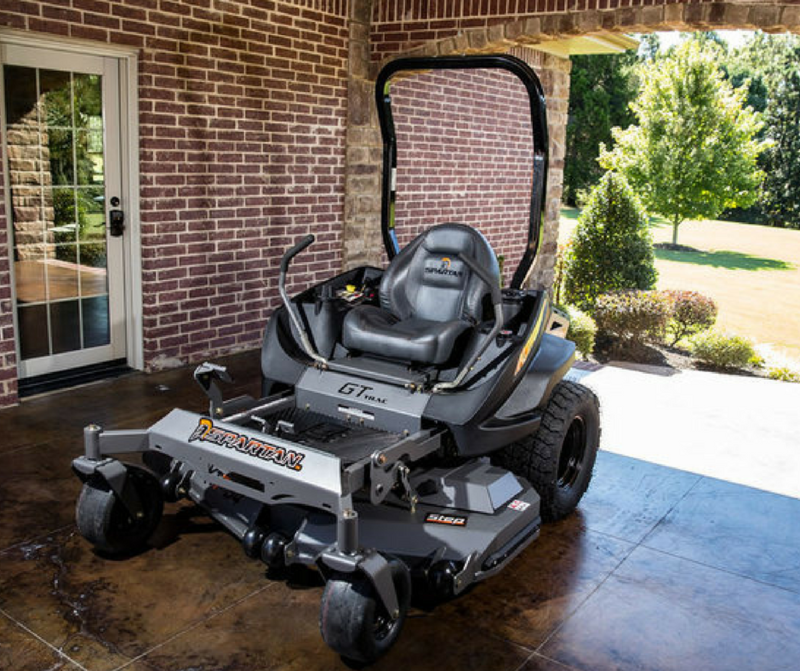 For a full list of maintenance and off-season storage tips, refer to your Spartan Mower Owner’s Manual. Storing your Spartan Mower in a dry place is important to the life of your mower. Rain and snow can cause excessive water build up inside the mower and can completely ruin electronic components. Our Spartan Mower Cover with a drawstring bottom is an option if you don’t have anywhere else. If possible, Spartan Zero-Turn Mowers should be placed in a lawn mower shed or a garage with other outdoor equipment. DO YOU NEED HELP WITH YOUR SPARTAN MOWER? 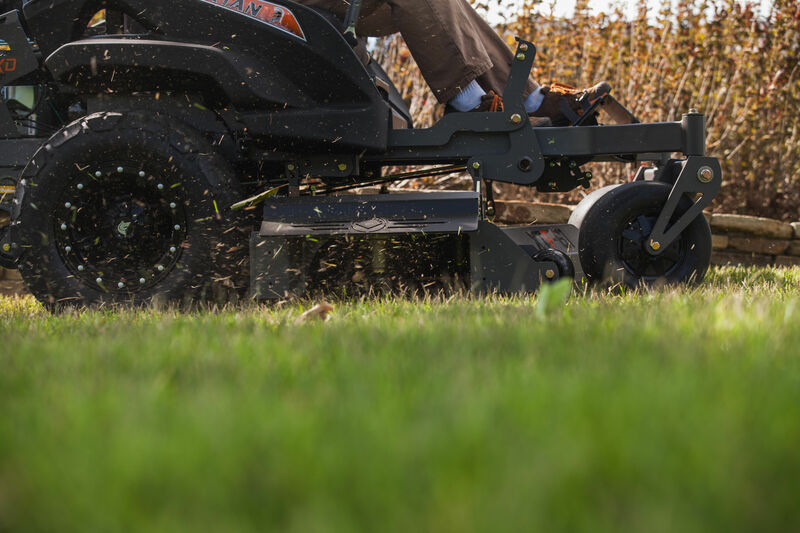 The tips mentioned above are just a few things you can do to help your zero-turn mower be ready to go when spring and warmer temps come back around. If you don’t have the time or you need someone else to take over your mower maintenance, then call your local Spartan Mower Dealer. They know exactly what needs to be done to your Spartan Mower. And while you are at your local Spartan Mower Dealer, check out all the accessories you can add to your Spartan. The Spartan Canopy is a great accessory for the hot days of summer and the Spartan Striping Kit is the perfect addition for those who want their lawns to be the envy of the neighborhood. You can even get a Spartan Service Jack to help with regular mower maintenance. To learn more about these products and Spartan Mower specs, visit us online at SpartanMowers.com or visit a Spartan Mower Dealer near you today!